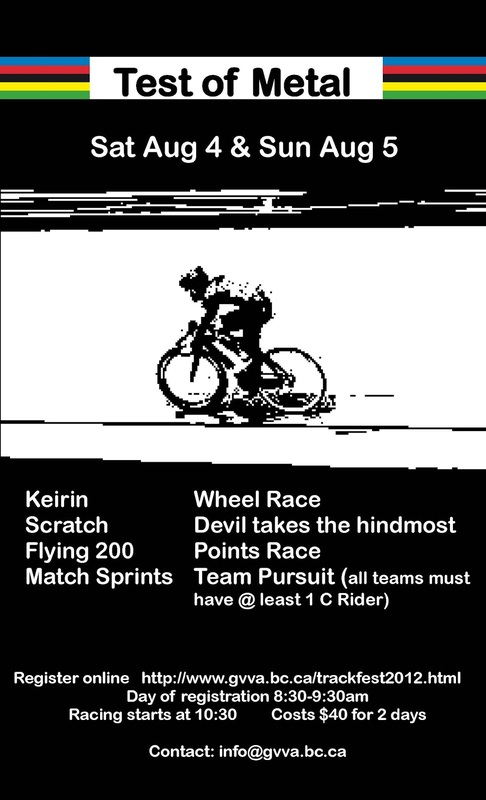 Our friends at the GVVA are thrilled to invite the South Island fixed-gear community to race at this year's Westshore Velodrome Test of Metal! For all of you who have been duckin' the 'drome because you couldn't afford to do the Learn-to-Ride/Race (LTR) courses, this is your chance to come out and try turning left...fast! Your events will take place on Sunday, August 5. We do, however, urge you to come out and watch some spectacular racing on Saturday after we're done watching the Olympic Women's Team Pursuit final at Broad Street Cycles that morning. Rental track bikes will be made available to you free of charge if your fixie isn't quite race-ready. This is going to be a whole lot of fun and a great chance to see what all the fuss is about at the track! 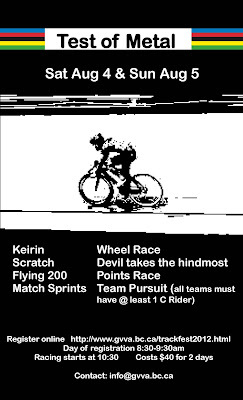 Keep up with the latest news from the Westshore Velodrome at www.gvva.bc.ca.